Annie Michalski, one of two winners of the 2016 Collision Repair Education Foundation’s Student of the Year Award, says she feels welcome in a world where she never thought she would, and she’s planning to stick around. The automotive collision repair industry is lucky to have her; in a time when demands are rising, technology is advancing rapidly, and the vast majority of employees are male and over age 35, it’s in desperate need of people like Michalski. She’s hoping to make the industry more welcoming to others like her: intelligent millennial women. 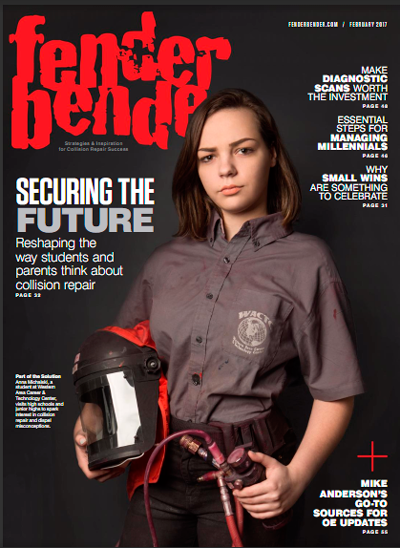 Annie Michalski, a 2016 Student of the Year winner, was featured on the cover of the February 2017 issue of Fenderbender magazine. When she was first introduced to the collision repair program at her school, Michalski was a little intimidated. “I won’t lie, anytime I was ever approached about the industry… it was older men who were… shown as the standard in the field. I think we need to break that stereotype.” Within a few days, she decided it was the opportunity she needed to prove herself as both a young person and a woman. Michalski has studied collision repair since her sophomore year of high school, and this year, was selected as a CREF student of the year. Michalski was also interviewed by CollisionWeek publisher Russell Thrall. The video of that interview appears below. In the video above, Michalski explains what attracted her to a career in the collision industry, how her family and friends reacted and supported her decision. She also talks about the support she has received from the industry, including from Petra Schroeder, chair of the Women’s Industry Network, as well as the Foundation. Michalski graduated high school in 2017 and is attending college, planning to study business. She plans to combine the business skills she learns in college with the technical skills she gained in collision repair to find a career in the industry upon graduation.